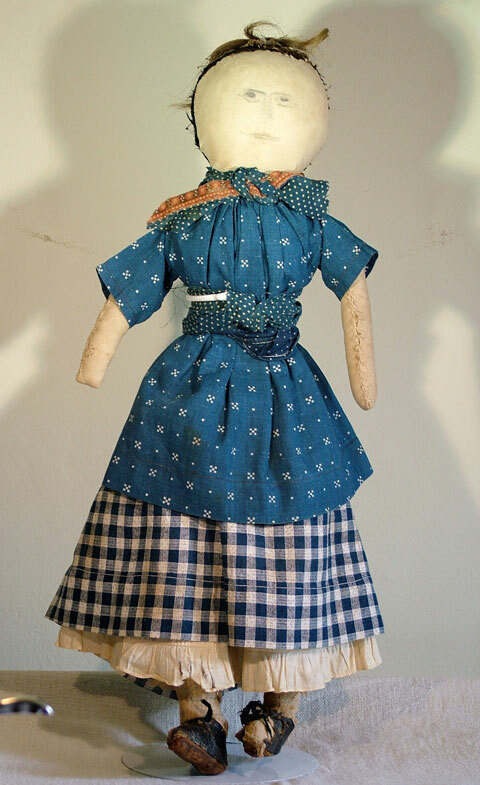 I sold this doll some time ago and when I did I had mixed feelings and always thought I should have kept her. As fate would have it, the person I sold her to went into an assisted living facility and I was able to purchase her back and own her for a little while. As things go, I am buying very little for myself these days so I am offering her for sale. 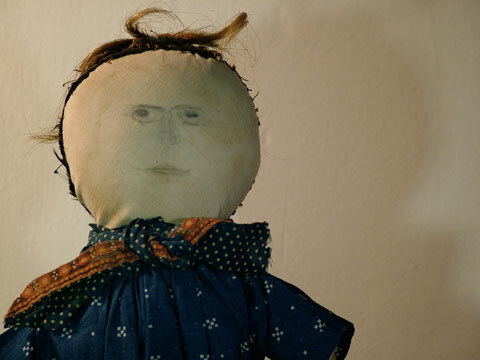 She is entirely hand-sewn and her body, which is firmly stuffed with cotton batting, is made out of a heavy cotton twill while her face is fashioned of a fine homespun linen and her cloth hair out of black silk. She has a very expressive yet naively drawn pencil face, as well as a “tuft” of human hair. 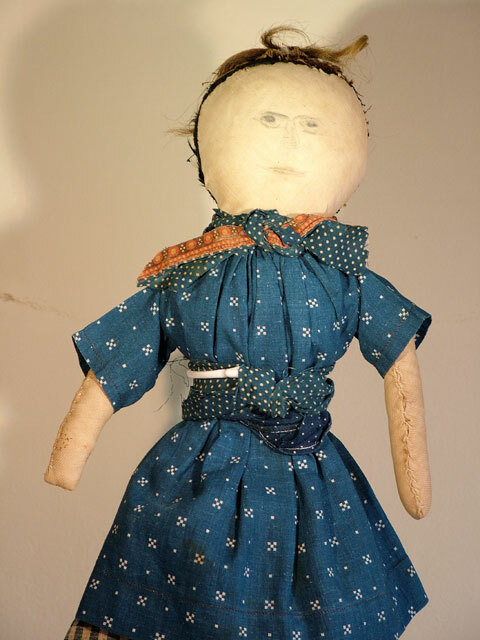 She stand 18 ½ inches tall and measures 4 ½ inches across the shoulders. 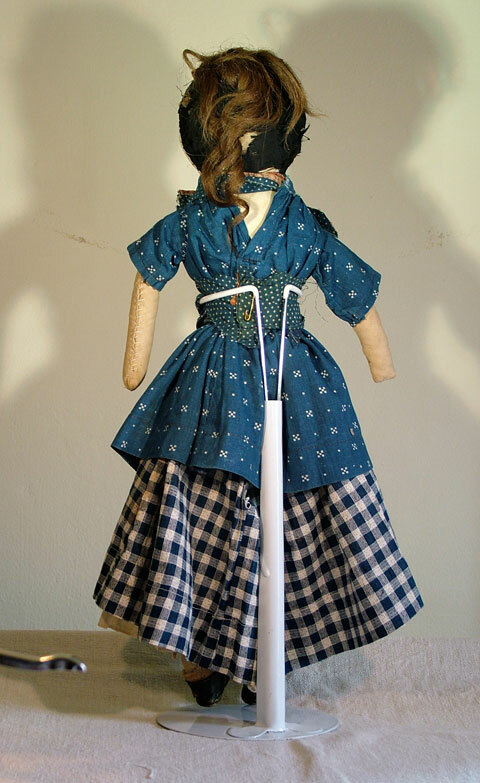 She has been re-dressed with a period skirt, blouse and scarf but comes with her original 1860’s dress which has a split up the center of the bodice to reveal the homespun backing within. Taking a piece of cloth from its ample hem and making a patch on the lining can probably fix this. The dress is wonderfully detailed in that it has stays inside the lining of the bodice that feels like bone, and a wonderful calico pocket inside the skirt. It is also painstakingly and finely hand-sewn, so I think it is worth the effort to restore it – but I will leave that to a more skilled seamstress than myself. 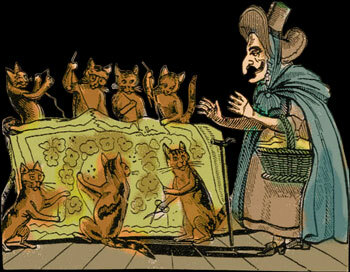 The 19th C clothing she now wears is primarily treadle sewn with some hand finishing. In addition to her original dress, she also still retains her original hand-made leather shoes, fine wool stockings and petticoat. 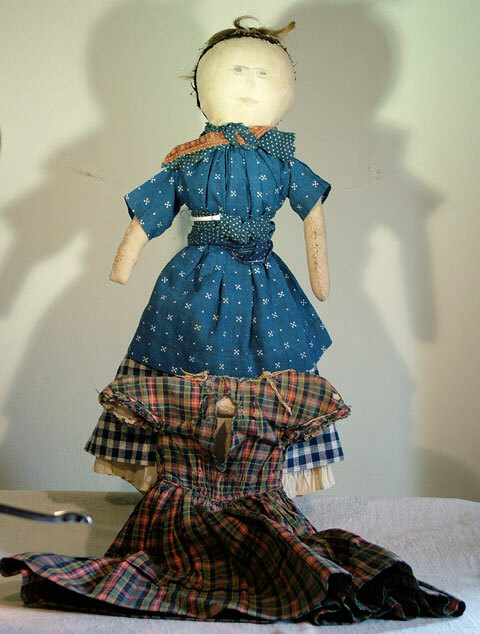 Judging by her clothing and construction, I would say she dates to the third quarter of the 19th C.
Originally purchased in New England, she is whimsical, wonderful and very, very folky!